Work life has been terribly busy this last week. So when the weekend came, I felt I really need a treat. And for a Foodie like me, what better way there is to de-stress than cooking? I made a trip to Fair Price Finest to look for a good cut of steaks. Lucky me! Fresh stocks of meat from New Zealand are still available. I opted for a 150-day grain fed rib eye steak. The moment I saw the meat, I felt some excitement started to build up within me. The marbling of fats in the meat is such a joy to behold. And boy, it was not cheap! These 2 slabs alone cost me S$38 bucks. Well, what's the surprise? Good quality usually comes with a price tag. For tonight, we're having a western set meal. 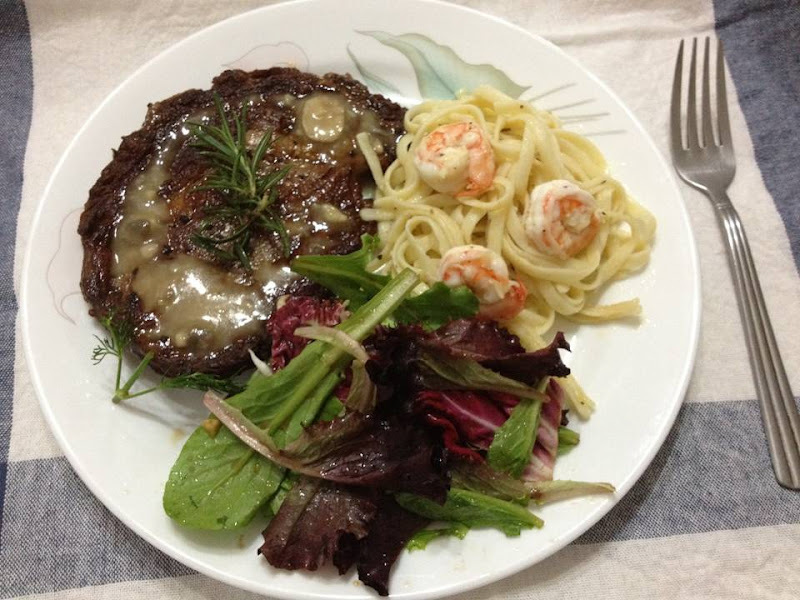 Fresh Greens Salad with Home made Vinaigrette, Linguine with Shrimps Scampi, Pan Roasted Rib Eye Steak and Very Berry Cheese Cake for dessert. 1. Mix all the dressing ingredients in a bowl. Continue mixing until emulsified. 2. Add into the fresh greens and toss to coat it with the mixture. 1. Cook linguine until aldente. Drain and set aside. Reserve 1/2 cup of water. 2. Melt butter in a pan. Add olive oil. Saute garlic until fragrant. 3. Add in shrimps and saute until it turns pink (about 5 mins). 4. Add pasta water reserve. Season with salt, pepper, basil and kalamansi juice. 5. Add in cooked linguine and toss to combine. 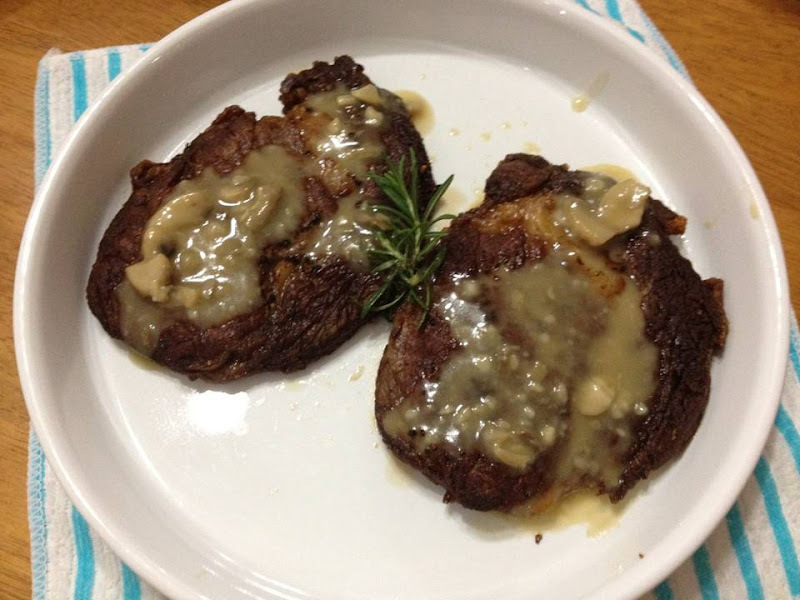 Pan Roasted Rib Eye Steak - This is a bit overdone I guess. But, we're just not into rare nor medium rare type of steaks. My taste buds specifically is not oriented into the "bloody" character of meats. If you prefer otherwise, the time of cooking can be varied to suit your liking. This is the 3rd time I'm doing this steak so the post on the recipe can be found here. It's not my first time to prepare a cheese cake but it was a first for this kind. And I couldn't be happier for making it a success. 1. Mix graham crackers, brown sugar and melted butter in a bowl. Transfer into an 8 inch non stick baking pan and press firmly. Allow to set in the fridge for at least 30 mins. 2. Beat cream cheese and white sugar until smooth and fluffy. Set aside. 3. Add gelatin into the water and set aside to soften. Heat over low heat until gelatin is completely dissolved. Add into the cream cheese mixture. 4. Beat whipping cream until soft peaks. Fold into the cream cheese mixture. 5. Pour over the prepared crust and spread evenly. Top with the fresh fruits. 6. Chill for at least 2 hours or until set. ﻿I recently committed myself to a new mantra at home. Whenever possible, I would like to stage a special weekend dinner for the family hence the title of this post. So wish me good luck and may this be a good start of the many delightful dining experiences to be had at home.